This is such a quick and easy recipe to make and so delish! My No Bake Choc Fudge Brownies are perfect to satisfy those sweet cravings. Ok, so I could say I made these so my allergic boy doesn’t miss out on treats. But, in total transparency the truth is these babies are for me! I’m not sure if its the cold weather, female hormones or I haven’t been taking my minerals, but I’ve been craving something sweet after dinner lately. This is it! No guilt and definitely satisfies those sweet cravings. In a medium sized saucepan, place coconut oil, coconut sugar, coconut cream and salt. Heat gently while stirring until melted. Bring to the boil and reduce heat to a simmer. Add choc chips, flour, cinnamon, biscuit crumbs and peppita’s. Stir until combined. Remove from heat. Pour into a lined slice dish. Place in fridge to set for a few hours. Remove and cut into slices. *The biscuit crumbs I used were Leda Gingernut Cookies. You should be able to pick them up from your local supermarket or use whatever biscuits are okay for you. When you make these babies, they are best stored in the fridge. If you wanted them a bit firmer, you could replace half the coconut oil with cocoa butter. I used Enjoy Life Choc Chunks which are Top 8 free and our go-to chocolate chips. You can buy them from health food stores or online. 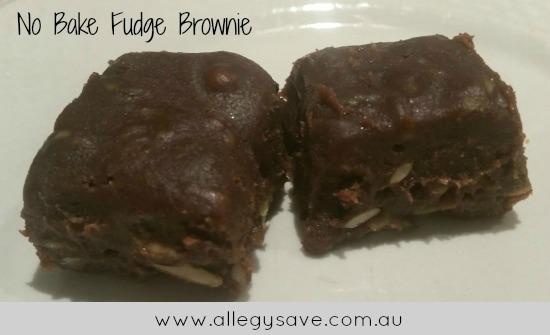 These are great with a cup of tea after dinner or when you feel like eating something naughty. They are fast becoming a favourite in our household… I may even let the family try them soon!